Some function rules follow a specific form. 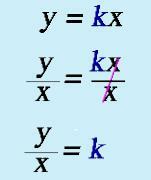 For example, we learned the relation for linear equations in pre-algebra was y = mx + b. There are two other function relations that have specific rules that we learn in algebra: direct and inverse variations. Okay, so like I mentioned, we learned back in pre-algebra the form that a linear equation takes, y = mx + b. In that particular function or rule, the constant is b, and this constant is also the y-intercept. The slope is denoted by m. This is all old news because you have done so many problems involving linear equations and linear functions and finding slope and blah-blah-blah. Notice any similarities? Differences? The linear equation has + b and the direct variation doesn't…and instead of m for a coefficient, the direct variation uses the letter k.
It tells us that a direct variation is…a LINEAR EQUATION! And, the slope is represented by k (why the powers that be didn't stick with the letter m is beyond me! It would have made things so much easier, right? Oh well, why makes things TOO easy…). Can you figure out what the y-intercept of each and every line is? This shouldn't be too difficult…Did you guess (0, 0)? You'd be correct! The reason for this is simple to determine if you follow the logic of the linear equation function. Since there is no "+b" then it stands to reason that the y-intercept is (0, 0). Let's see some of the ways you can determine a direct variation. 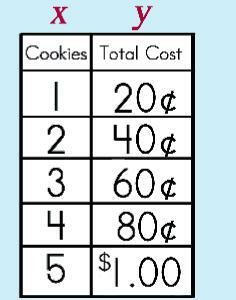 Here is the price list for cookies at Le Bakerie. Is this a direct variation? In a table, you can write the columns to fit a coordinate grid format by writing one column to represent the x-axis (the 'input' or domain) and the other to represent the y-axis (the 'output' or range). You can then check each to make sure there is indeed the same number (is the number 'constant?') between the values. Let's take a look at the data in this table. Yep, we do have a constant! The ratio is 20 each time so that means the constant of variation is 20. This IS a direct variation! This means we can write a function rule! Now that we know that data shows a direct variation, we can write a rule or function or equation to show this. All direct variations follow the same form, y = kx, so we can put our rule in that form by simply SUBSTITUTING our constant (k) into the form! We can even graph our results. What is the y-intercept? 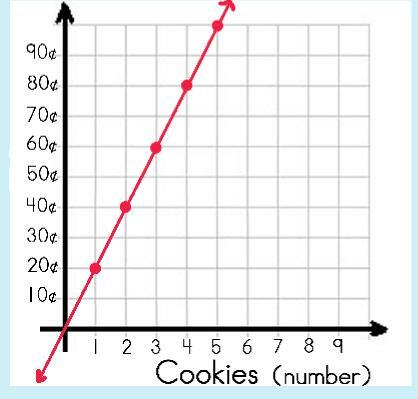 Ahh…did you notice that the line intercepts the y-axis at 0? Yep, right at (0, 0)! You could put the numbers from the ordered pair, knowing that in the ordered pair (5, -10) are in the form (x, y), into the formula by using the Substitution Property and then simply solving for k OR, do what I think makes things EASIER. Start off with the form for a direct variation. Use the Division Property of Equality to move the x over to the other side. Voila! Now, you can see how to get the constant of variation using your ordered pair! We are going to go back now to that confusing math problem to see how to use this 'new' equation that really isn't new. Let's put our numbers into our 'new' equation, shall we? Okay, so we substitute the -10 for the y in the numerator's place. We substitute the 5 for the x in the denominator's place. We can reduce the fraction to -2. Voila! We now have our constant of variation or k! Since we need to write an EQUATION for the direct variation, we just substitute our newfound k in place of the k in the equation and we are finished. First of all, remember that all Direct Variations follow the simple form of y = kx. There should be NO 'extra' anything anywhere. So, if you can put your equation into this form, then, voila! Your equation is a direct variation! Let's see what I mean by looking at two typical equations. Looking at the two equations now, which one fits the form, y = kx? The first one or the second one or both? Did you say the first one? You are correct! The second equation does NOT fit because you do not have a direct change to the x…you cannot re-write the equation into the form of a direct variation! See? It wasn't difficult to figure out, was it! Easy-peasy, lemon-squeasy! Special Note: After awhile, it is going to be REALLY easy to 'spot' those equations that are direct variations once you get the hang of it because you will soon see that IF an equation is in the form like this: 8x + 2y = 0 or just 3y - 5x you will KNOW it is a direct variation. Ponder THAT one for a bit and I bet you will see why! Check this out! You can use the concept of direct variation to help you with solving word problems! Yep, it's true…Seriously! Have you ever come across a problem that looks something like this? The Toyota Prius can travel 288 miles on eight gallons of gas. How much gas will the Prius require to travel 594 miles?